This substantial old building, known locally as ‘Da Haa o’Brough’ (The Hall of Brough) was built in 1672 by Robert Tyrie, proprietor and fish merchant, trading with merchants from Hamburg etc. These merchants formed a guild called the Hanseatic League, it was a political as well as commercial association, and acted as protection from pirates, however the pirates won in the end when, in 1696, they attacked the Hansa merchants in their shore trading booths in Shetland. This trauma together with other factors, such as the British 1715 salt tax, ended this lucrative trade with Shetland. For more than 200 years this house was home to a succession of merchants who also owned the Brough estate, till in 1842, a new house was built even nearer to the trading booths on the shore and the ‘Old Haa’ received its first tenants. 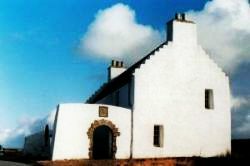 In 1984, the newly formed ‘Old Haa Trust’ started and the work of transforming this historic building to an attraction for visitors. 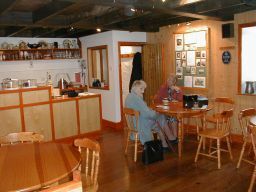 Now, 20 years later, the ground floor area is divided into a local history museum, and a tea room in what was the old kitchen, a gallery and craft shop in what was called ‘The Old Smithy” which was said to have been used as a school before the blacksmith arrived, it is now connected by a door into the main building. On the second floor is the local history exhibition room, which is changed each year, and the natural history room with its whale jaw and lifelike pair of otters - victims of a sad road accident about 10 years ago. This is the room where the Bobby Tulloch collection will be viewed, starting in Spring 2005. Between these rooms are two smaller rooms. They house the archives: many albums of local photographs and family history on computer and microfilm. The attic rooms are used for storage and rooms in the Old Smithy are used as a project room and a recording studio. Outside the building there’s a back garden with picnic table and old-fashioned herbaceous borders. In front of the house is a monument to the airmen who lost their lives in 1942 in a Catalina crash on the moors of South Yell. Another monument is at the planning stage and is to be unveiled in Spring 2005. It is to be dedicated to the memory of Bobby Tulloch.